Following the unveiling of the all-new Scenic at the 2016 Geneva Motor Show in March, Renault has now pulled the covers off the larger Grand Scenic version. The new Grand Scenic has a longer wheelbase and shorter rear overhang compared with the previous generation version. 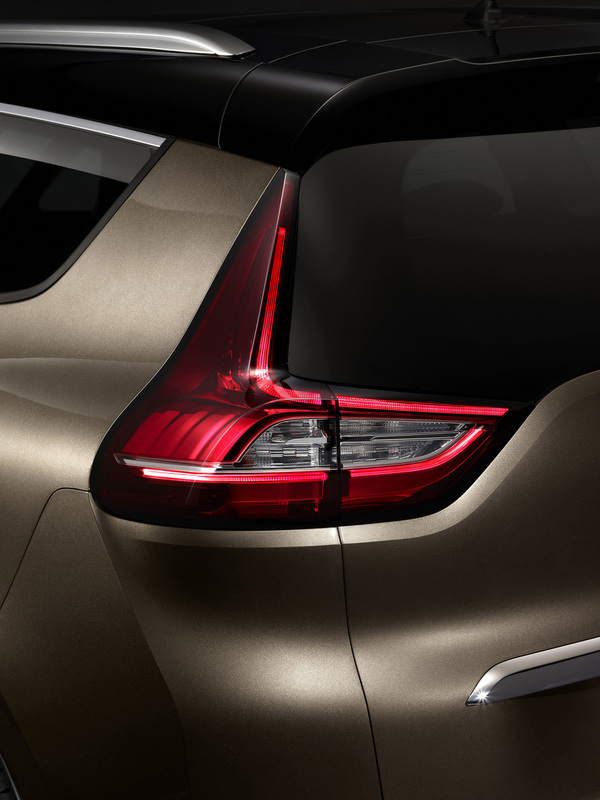 The design features sculpted sides and a distinctive belt line towards the rear where vertically arranged permanently-lit 3D-effect rear lights differ from the regular Scenic’s horizontal cluster. The wheels are customisable with choice of rims and inserts, called ‘add-ons’ that have been devised to save weight and streamline the car’s aerodynamics for improved fuel consumption. Renault says that the fitment of specifically developed tyres for lower energy consumption and enhanced aerodynamic efficiency, also guarantees class-leading rolling resistance. Among the external design features, a two-tone livery is available from the second equipment level up, along with matt-finish aluminium roof bars. There’s a new fixed, panoramic glass roof with no cross-member, allowing more light into the cabin while at the rear, a Metal Grey diffuser has been incorporated in the bumper skirt. 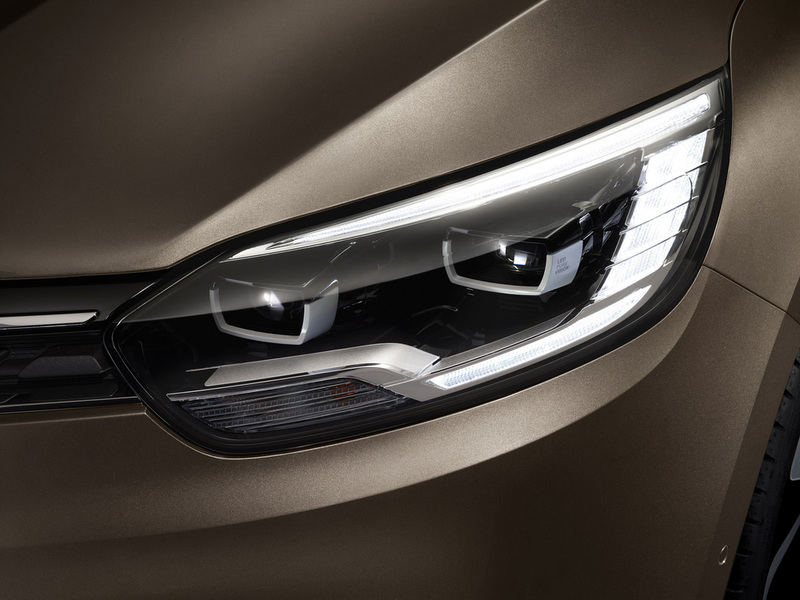 The launch colour – Vision Brown – is specific to the new Grand Scenic. The new Grand Scenic comes with a suite of driver aids including Active Emergency Braking (AEBS) with Pedestrian Detection as standard equipment for the first time in the segment. The list continues with Multisense experience, an R-Link 2 multimedia tablet complete with a large 8.7-inch display and a full-colour head-up display. A One Touch Folding Seat function allows the rear seats to be folded automatically to obtain a flat floor and facilitate loading. Meanwhile, the new Grand Scenic is 24cm longer than the new Scenic and consequently boasts extra boot space and carrying capacity compared with its sibling: 718 litres VDA (five-seat version) for an extra 222 litres VDA compared with the new Scenic. A choice of five diesel powerplants are available – including an electrified Hybrid Assist engine – and two petrol engines (depending on market). Hybrid Assist, which comprises an electric generator and a 48-volt battery, recovers deceleration energy, thereby allowing the electric motor to assist the internal combustion engine for a more responsive performance and a lower fuel consumption. Both the all-new Scenic and Grand Scenic will be available for sale before the end of this year. The final UK model-line up, specifications and pricing have yet to be released.